We’re in the habit of picking up old Britbike engines around here, be it for better or for financial ruination. Delving into the old air-cooled parallel twin motors is always a fascinating learning process as the pool of active restorers dwindles with each passing year, leaving us to either lean the craft now, or forever be lost their special, low-tech magic. Oftentimes, we find the motors and basket case bikes to be in what could best be described as very curious mechanical condition. Owners habitually begin rebuild projects only to abandon them for whatever reason, leaving many classic bikes resembling scale modeling kits half-finished by attention-starved adolescents. I’m often tempted to cut corners and save time- a necessity when the magazine’s deadline rolls around every 60 days-but I’ve learned that shortcuts, like cheap parts, are never effective in the long run. Take a 1964 Norton Atlas 750 engine we purchased from a California shop that was permanently closing its doors recently. The motor kicked through with no issues and there was decent compression when we fitted a gauge to the spark plug portals. However, Nick Coumos, our resident Norton Guru stood silently by, shaking his head is disagreement when I suggested we proceed with rebuilding just the top end. “There’s a section in the bottom end called a sludge trap and that name is there for a very good reason,” Nick explained. 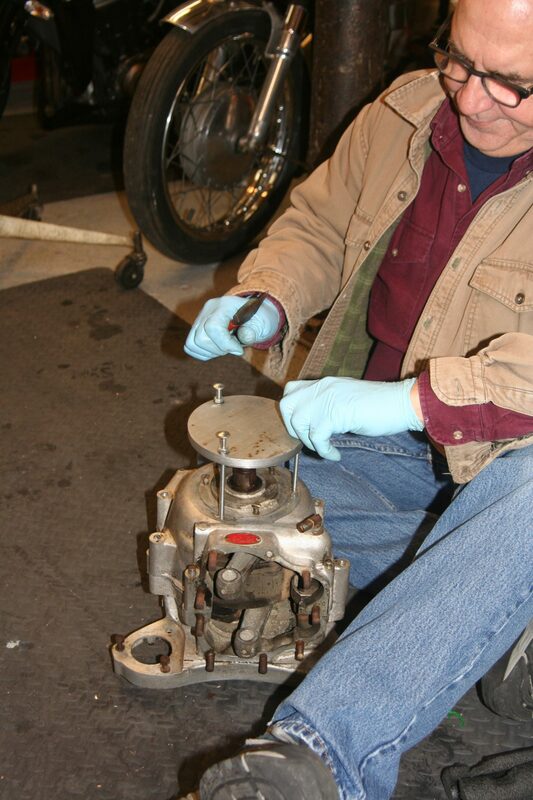 Lurking deep in the bowels of every long-dormant motorcycle engine is a build-up of congealed lubricating oil, tiny bits of metal and other forms of debris caused by the internal combustion process. Splitting the cases to access this potentially harmful goop is an unpleasant necessity, Nick says, ad I’ve god reason to believe him. Lucky for us, Nick’s got a handy case-separation tool that he build specifically for Norton motors, so the job should take an hour or two, tops. Better safe (and bereft of a couple of hours downtime) than sorry. Read more about this and other tech tips in future issues of Cafe Racer magazine. Keep on wrenching!